Page Posts need not be appear immediately. Post date can be in the future or in the past. There is a story hidden behind these options. The story of how we work and how Word is trying to help us. Learn these options and manage column widths in Word tables confidently. Yesterday, I was featured on the Microsoft MVP site. Scrolling is inevitable. But there is a catch. If you press Page Down, the next screen of rows are shown. The problem is, we also need to scroll horizontally. What do you do then? What is the most efficient way of scrolling horizontally? Here is another test. Simple task. But that does not mean you know the most efficient method. Try it out. You will be surprised! The test is simple. What is the most efficient way of sending a mail to all contacts from a specific company? (The contacts are already in your contacts folder). Yes, you have been copying formulas for decades. I know. But you don’t know the most efficient method – most probably! Try it out. Spend just 4 minutes of your time. 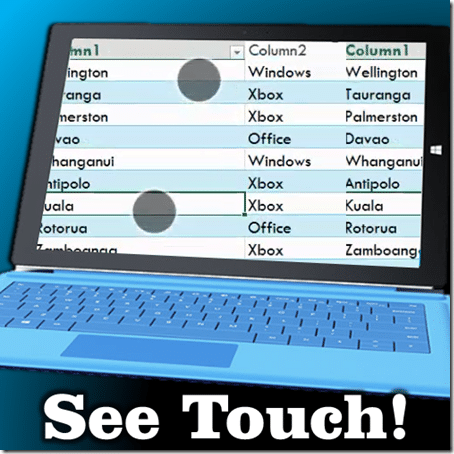 This article applies only to Windows touch devices. We often get confused while using Touch to perform actions on the screen. Sometimes the touch gestures don’t work as expected. Windows has a brilliant feature to help you. Estimated reading time 10 min. Data Analysis and Reports has been a major theme for my articles so far. Here is a collection of 50+ articles, categorized and sorted in the recommended reading order.